Urea is a metabolic waste product that accumulates in the body in the setting of chronic kidney disease. It is routinely measured on blood tests as a marker of kidney function (higher urea levels indicate lower kidney function). There has been much controversy about whether urea itself is truly toxic. In studies done in the 19th and 20th centuries, urea was infused into dogs, pigs and humans and this was reported to be well tolerated until blood urea levels reach 10x above normal at which point there was weakness and nausea. 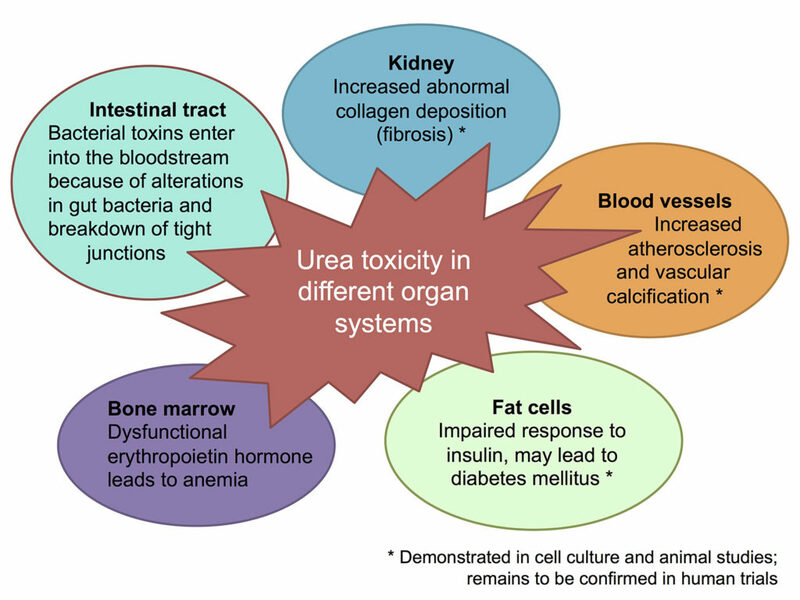 In our review paper, we discussed more recent evidence pointing to urea as a potent toxin that affects several organ systems (Fig. 1), leading to the premature aging syndrome that is seen in chronic kidney disease. Fig. 1. Blood urea increase in chronic kidney disease and promotes several disease pathways including intestinal inflammation, atherosclerosis, vascular calcification, anemia, kidney fibrosis and insulin resistance. There are several limitations of the clinical trials done in dialysis patients (such as the HEMO and FHN trials) that reported no benefit with more rigorous urea clearance. One major point is that dialysis (end stage kidney failure) patients have been exposure to elevated urea conditions for many years, and the systemic damage may be too far advanced at that point for urea lowering to exert any benefit. Secondly, the hemodialysis treatment itself can activate inflammation and obscure benefits of urea reduction. Third, the conventional Kt/V formula as a measure of urea clearance and adequate dialysis therapy is over-simplified, as many other toxins as well as water/salt balance affect clinical outcomes. Finally, blood urea levels can be affected by a variety of factors aside from kidney function, including dietary protein intake, dehydration and internal bleeding. The most convincing evidence that lowering of urea levels is advantageous comes from the practice of adhering to a low protein diet to slow progressive loss of kidney function. Low protein diet was first promoted by the Italian nephrologists Giovannetti and Maggiore in the 1960s as a way to limit production of urea and other nitrogenous wastes. Since then, several studies have shown that a carefully monitored low protein diet with avoidance of malnutrition can be protective for kidney function and delay progression to end stage kidney failure. Urea exerts both direct and indirect toxic effects on several organs in the body. A high urea level causes changes in the gut bacterial population (microbiome) such that A) there is increased production of bacterial toxins such as indoxyl sulfate and p-cresyl sulfate; and B) inflammation in the intestinal wall leads to break down of intercellular tight junctions. The net result is that bacterial toxins move across into the bloodstream and induces systemic inflammation which is linked with progression of kidney failure and cardiovascular death. Urea also directly promotes cell death and calcification in blood vessels. Further, elevated urea levels impair the response of fat cells (adipocytes) to insulin. This insulin resistance likely increases the risk for pre-diabetes in patients with chronic kidney disease. The indirect toxicity of urea occurs through irreversible modification of the body’s proteins by a process called carbamylation, due to exposure to cyanate (a breakdown product of urea). Elevated levels of blood carbamylated proteins in dialysis patients predicts higher death risk. Carbamylated proteins promote atherosclerosis of blood vessels, increase kidney injury through fibrosis (abnormal collagen deposition), and worsen anemia by impairing the function of erythropoietin hormone. In summary, there is mounting evidence that suggests a negative impact of elevated urea on patient outcomes. Consequently, urea per se probably participates in the pathogenesis of cardiovascular disease, loss of kidney function, insulin resistance, intestinal disease and anemia (Fig. 1), and has re-emerged as a true toxin and Dark Force in chronic kidney disease. Urea, a true uremic toxin: the empire strikes back.